ZP-900 Hydraulic Oil Anti-Foam is a combination of components designed to allow the user to optimize the additive content of each hydraulic fluid. It contains a wet anti-wear lubricant and dry dielectric lubricant, pour point depressant, viscosity index improver, foam reducer, oxidation inhibitor and seal revitalizer. This material will not reduce fluid lubricating ability as silicone de-foamants do, nor will it reduce fluid oxidation life. These components work to fight the most frequent problems encountered in hydraulic systems: wear, heat, oxidation, cavitation and leaks. 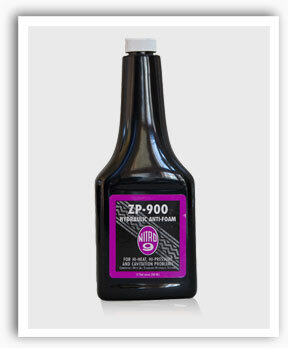 ZP-900 Hydraulic Oil Anti-Foam wet and dry anti-wear additives take over where conventional fluids break down. Pump, cylinder and valve wear are virtually eliminated by the surface and subsurface lubrication of ZP-900 Hydraulic Oil Anti-Foam. By forming a barrier against metal to metal contact, it reduces friction allowing increases in the load carrying capacity of the system. Straining on pumps is reduced allowing them to work at maximum efficiency. This also reduces friction heat buildup, resulting in less oxidation, varnish, sludge and acids. Valves are freed and the hydraulic oil lasts longer. What Would Cause Hydraulic Oil To Foam? Foaming develops as pumps pull in air and mix it with oil. Air may enter due to faulty seals, low fluid level, or even during normal operation. The result can be disastrous. Excess noise in the pump indicates cavitation, which is the formation and collapse of vapor bubbles in the oil. When bubbles collapse, the effect is that of miniature hammer blows, which work to destroy the pump. ZP-900 Hydraulic Anti-Foam guards against disastrous pump cavitation with a de-foamant and against the power losses that occur when bubbles are in the hydraulic system. ZP-900 Hydraulic Anti-Foam reduces the heat load and adds a viscosity index improver to keep oil from thinning out. Eliminate this major headache with ZP-900 Hydraulic Anti-Foam. At 120°F or below, oil oxidizes very slowly. Above 135°F, the rate of oxidation doubles for each 18° increase in temperature. Oxidation leads to sludging, causes formation of harmful acids and creates more heat. Seals deteriorate and thin hot fluid leaks out. Hoses fail from being exposed to excess heat, resulting in more fluid loss, downtime, and housekeeping problems. ZP-900 Hydraulic Anti-Foam will keep seals pliable, reduce heat and with our de-foamant and viscosity improver, keep pumps from caveating. Another reason for using ZP-900 Hydraulic Anti-Foam is that as oil seals become brittle, they loose their sealing ability resulting in leaks. These leaks can be reduced by increasing oil thickness but this has other negative results, such as encouraging cavitation and increasing heat. ZP-900 Hydraulic Anti-Foam corrects the imbalance with specific components to resolve the basic problems in hydraulic systems. The best answer is ZP-900 Hydraulic Anti-Foam. Some hydraulic systems will not have the exact fluid for which they were designed. Viscosity may be incorrect. Formulation ingredients may be wrong or in too low a concentration. Applications: ZP-900 Hydraulic Anti-Foam is compatible with all standard hydraulic systems. For special application, write to address below. Directions: Ratio – 1:20. Agitate well. Add one part ZP-900 Hydraulic AntiFoam to each 20 parts of hydraulic fluid in the system. Compatible with all hydraulic fluids.